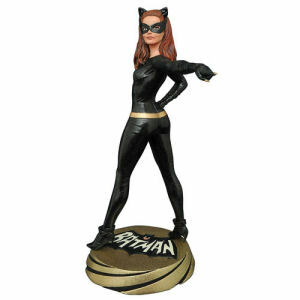 We have Just Sold out of Batman Classic 1966 TV Series Catwoman Premier Collection Statue. Not to Worry! Fill in the Notify me When Available and you will be the first in line for our restock of Batman Classic 1966 TV Series Catwoman Premier Collection Statue !! From the Batman collection by Diamond Select. Batman Classic 1966 TV Series Catwoman Premier Collection Statue. This Catwoman statue is limited edition of only 1966 pieces and comes packaged with a certificate of authenticity in a full-color box. Measures 6 inches tall.